Don’t be alarmed by the long list of ingredients – this spicy lamb tagine is incredibly easy to make! The wonderful mix of spices give the lamb a delicious depth of flavour and your microwave cuts out all the hard work. Made using a Panasonic microwave. Put the lamb and spices into bowl and mix well, put to one side. Place oil, onions and garlic in a large (3 litre) casserole dish. Cover dish with lid and cook on HIGH MICROWAVE for 5 mins. Add the spiced lamb and remaining ingredients to onion mixture and mix thoroughly. Cover and cook on CONVECTION 160°C + WARM MICROWAVE for 1 hour or until tender, stirring halfway. 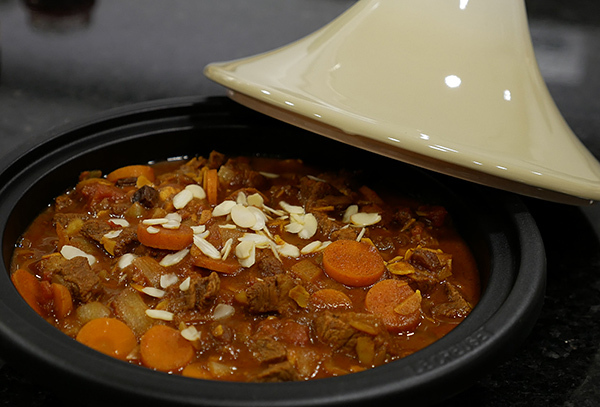 Serve straight from the casserole dish, or in a traditional tagine pot for added flair. Made using a Panasonic microwave.